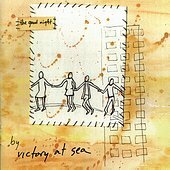 Victory At Sea's greatest asset is their ability to create poppy, lightly rocking numbers that hover there, too rocking to be subtle but too mellow to make you want to rock out. Instead, you sit there listening to the record, enchanted by its beautiful composition, the airy drums, the gentle bass, and the supplement of guitars. Their downfall, at times, is the vocals. When guitarist/vocalist Mona Elliott sings along with the more rocking songs, her voice is too overpowering, too commandeering, destroying the songs. However, when she tones it down, her vocal beauty matches that of the songs and everyone is a winner. I'll give this a B-.